Just reading this makes me want to scrub with disenfectant. I don't think anyone will be writing travel brochures about Middenmurk. The unofficial motto should be, if you have to go to the Middenmurk get out as soon as you can. Great blog so far. That table belongs in the 1e DMG; worthy of the man himself! 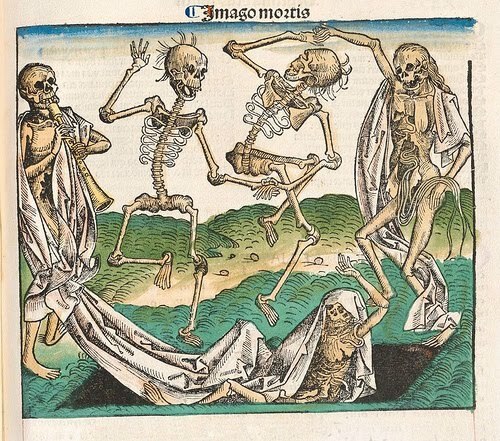 And those skeletons know how to PARTY! word verification: snopur - sound a snow leopard makes. 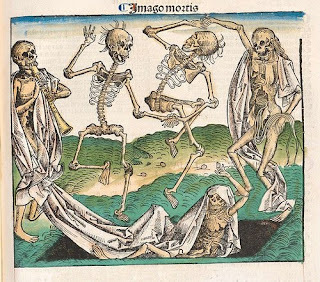 I need to work in leprosy and the plague to round out the list of iconic olde timey diseases. But I thought they were special cases that needed special rules. I can't remember ever reading about a leper colony in any D&D supplement ever. Why is that? What kind of Disneyfied world doesn't have the bell-ringing unclean to bring some atmosphere. I can imagine them hanging around outside dungeons begging alms from adventurers. As far as D&D and leprosy. Well, a Cure Disease spell can do wonders for a case of Leprosy. So no Leper Colonies... Any Lawful Good Cleric should go out of his way to cure diseases, and heal the wounded. Now if Leprosy was a magical curse, perhaps demonic in origin, then there might be problems. It wouldn't be nearly as easy to eradicate, or at least control. A neat concept. Inspires me to use it for my own campaign. Personally, I use RuneQuest, which has the nice idea that disease can be either like a poison or carried by a spirit. Or both... Either way the affected character has to resist its strength (vs. Constitution or vs. the Power characteristic) or fall sick. Miasma fits right in with this, so thanks for the idea! "As far as D&D and leprosy. Well, a Cure Disease spell can do wonders for a case of Leprosy. So no Leper Colonies... "
Interesting point. However, this runs contrary to the way I imagine the world. I guess the justification for the lack of squalor in high-fantasy D&D worlds is the presence of cheap and easily available magic, essentially analogous to technology, and producing conditions essentially similar to modernity. In my vision, a sixth-level cleric (which is the minimum level necessary to access cure disease) is something akin to a saint. Having the miraculous power to cure disease and free lepers from their suffering should not be something to be taken for granted but something rare and wonderful. I agree with Dave that cure disease is too neat and tidy (and if there's one thing the Middenmurk isn't it's neat and tidy).